1119 SPE NORTHERN CYPRUS (1975a) Pomegranates*. Block of 4 overprinted ORNEK (specimen). Painting by Guney. Scott No 26, Yvert No 14. 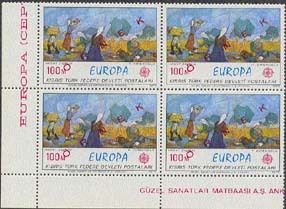 1120 SPE NORTHERN CYPRUS (1975b) Harvest Time*. Block of 4 overprinted ORNEK (specimen). Painting by Direklogu. Scott No 27, Yvert No 15. 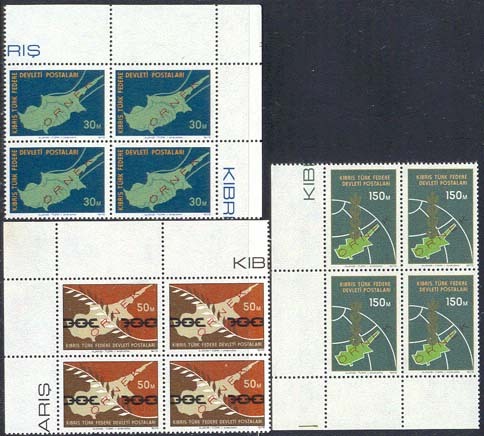 1607 SPE NORTHERN CYPRUS (1975) Map*. Olive branch*. Set of 3 in corner blocks of 4 overprinted ORNEK (specimen). Scott Nos 23-5, Yvert Nos 11-3. 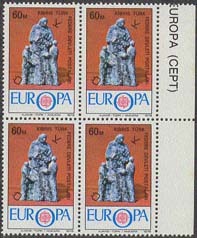 1122 SPE NORTHERN CYPRUS (1976a) "Expectation"*. Block of 4 overprinted ORNEK (specimen). Scott No 30, Yvert No 16. 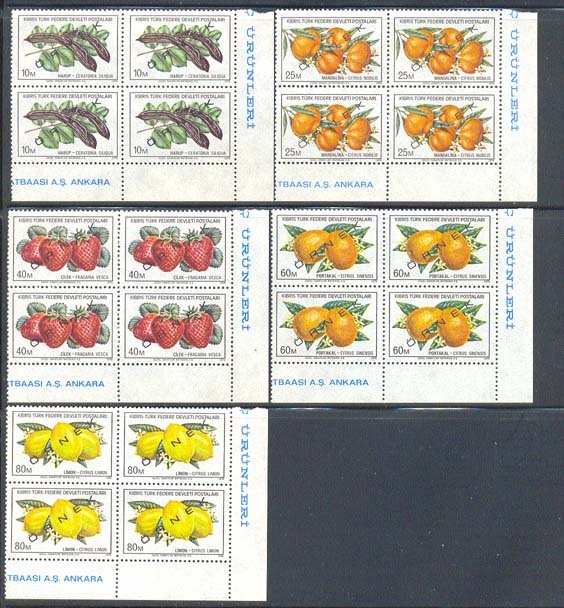 2072 SPE NORTHERN CYPRUS (1976) Fruits*. Set of 5 in corner blocks of 4 overprinted ORNEK (specimen). Scott Nos 32-6, Yvert Nos 22-6. 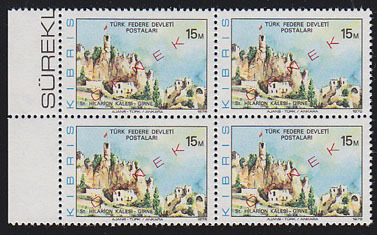 9811 SPE NORTHERN CYPRUS (1976) St. Hilarion castle*. Margin block of 4 overprinted ORNEK (specimen). Scott No 14. 10857 SPE NORTHERN CYPRUS (1976) Liberation monument*. Set of 2 corner blocks of 4 overprinted ORNEK (specimen). Scott Nos 39-40. 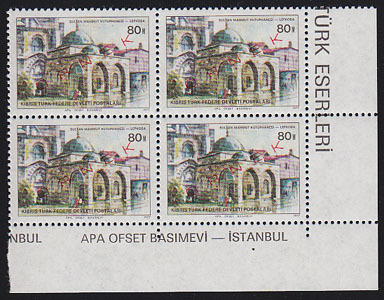 10912 SPE NORTHERN CYPRUS (1976) Ataturk Square*. Margin block of 4 overprinted ORNEK (specimen). Scott No 16. 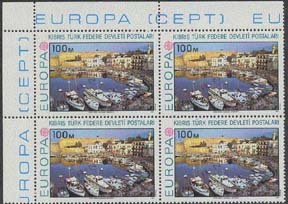 11206 SPE NORTHERN CYPRUS (1976) Kyrenia harbor*. Margin block of 4 overprinted ORNEK (specimen). Scott No 11. 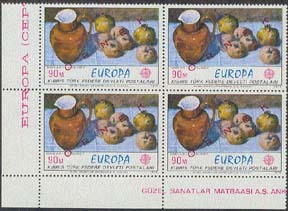 1004 SPE NORTHERN CYPRUS (1977e) Gourds*. Block of 4 overprinted ORNEK (specimen). Scott No 44, Yvert No 35. 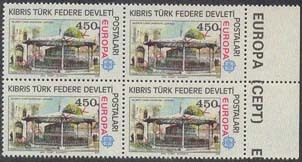 1005 SPE NORTHERN CYPRUS (1977f) Baskets*. Block of 4 overprinted ORNEK (specimen). Scott No 45, Yvert No 36. 1123 SPE NORTHERN CYPRUS (1977) Salamis Bay*. 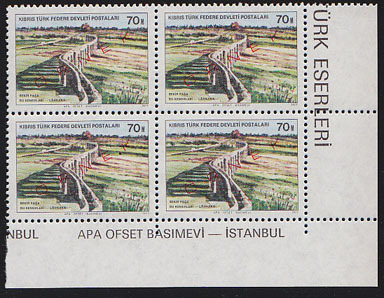 Block of 4 overprinted ORNEK (specimen). Scott No 41, Yvert No 32. 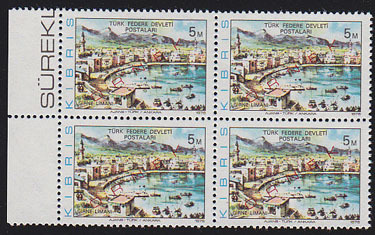 1124 SPE NORTHERN CYPRUS (1977) Kyrenia Port*. Block of 4 overprinted ORNEK (specimen). Scott No 42, Yvert No 33. 3698 SPE NORTHERN CYPRUS (1977d) Pottery*. Block of 4 overprinted ORNEK (specimen). Scott No 43, Yvert No 34. 9428 SPE NORTHERN CYPRUS (1977) Sultan Mahmut library*. 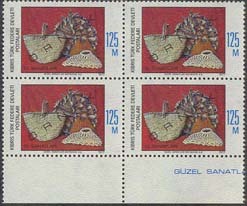 Corner block of 4 overprinted ORNEK (specimen). Scott No 49. 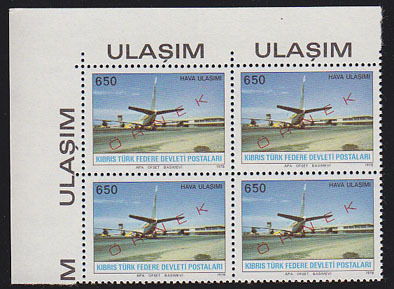 9429 SPE NORTHERN CYPRUS (1977) Mamik Kemal*. 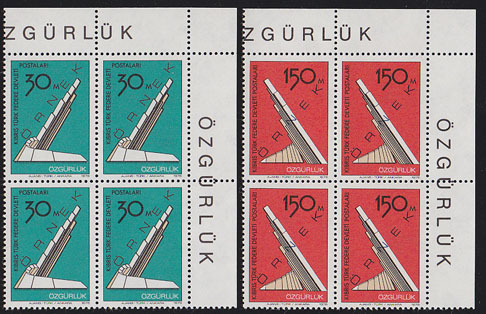 Set of 2 corner blocks of 4 overprinted ORNEK (specimen). Scott Nos 50-1. 9812 SPE NORTHERN CYPRUS (1977) Paphos Castle*. 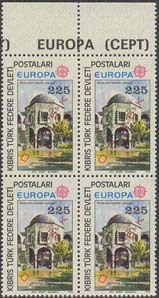 Corner block of 4 overprinted ORNEK (specimen). Scott No 47. 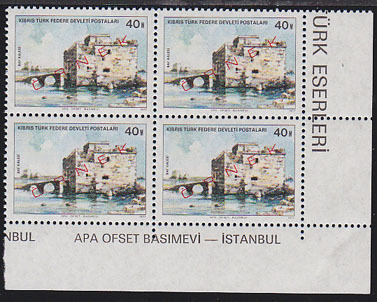 11857 SPE NORTHERN CYPRUS (1977) Bekir Pasha aqueduct*. Corner block of 4 overprinted ORNEK (specimen). Scott No 48. 1131 SPE NORTHERN CYPRUS (1978a) Oratory, Nicosia*. Block of 4 overprinted ORNEK (specimen). Scott No 55, Yvert No 46. 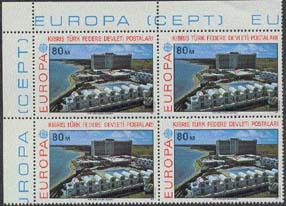 1132 SPE NORTHERN CYPRUS (1978b) Reservoir, Nicosia*. Block of 4 overprinted ORNEK (specimen). Scott No 56, Yvert No 47. 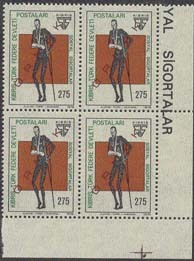 1554 SPE NORTHERN CYPRUS (1978a) Man with cane*. Block of 4 overprinted ORNEK (specimen). Social Security. Scott No 52, Yvert No 43. 1555 SPE NORTHERN CYPRUS (1978b) Man on crutches with sling*. 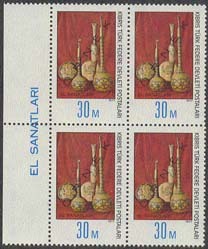 Block of 4 overprinted ORNEK (specimen). Social Security. Scott No 53, Yvert No 44. 9562 SPE NORTHERN CYPRUS (1978) Jet*. Corner block of 4 overprinted ORNEK (specimen). Scott No 59. 10858 SPE NORTHERN CYPRUS (1978) National Oath*. 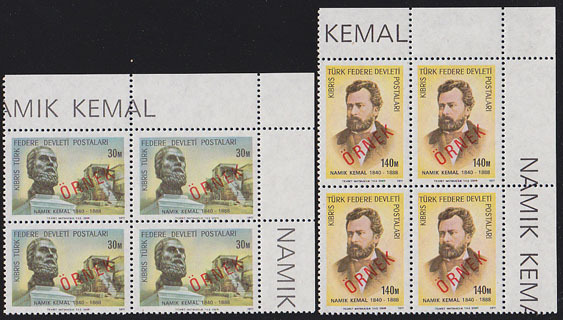 Set of 3 corner blocks of 4 overprinted ORNEK (specimen). Scott Nos 60-2. 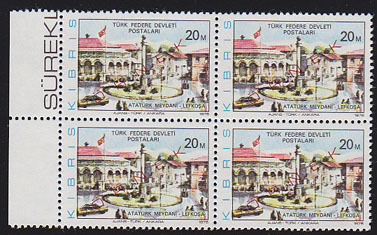 11921 SPE NORTHERN CYPRUS (1978) Kemal Ataturk*. 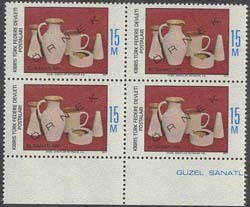 Set of 3 corner blocks of 4 overprinted ORNEK (specimen). Scott Nos 63-5.